The Republican Party has essentially dropped all pretenses of being representatives of the people. They are, with this execrable tax bill, thumbing their long and growing noses at us, all while opening up the nation’s coffers to serve as a feeding trough for themselves and their sponsors/lobbyists/donors. Let’s be perfectly clear. They are always in favor of privatization, which nowadays serves nobody’s interests save the few (the 1%) who own everything. Every move they make is designed to increase our dependence, while simultaneously removing the few social safety nets that exist. Their God is Mammon and they envision themselves as divinely situated and eminently deserving of their wealth and power. We are here merely to run their businesses, purchase their products, and keep our mouths shut and our bodies where they can use them as they see fit. How does raising taxes on the middle class, taking away healthcare for millions of people, ignoring science, exalting one religion over all others, failing to help victims of disasters, and raising the national debt over $1.5 trillion promote the general welfare? 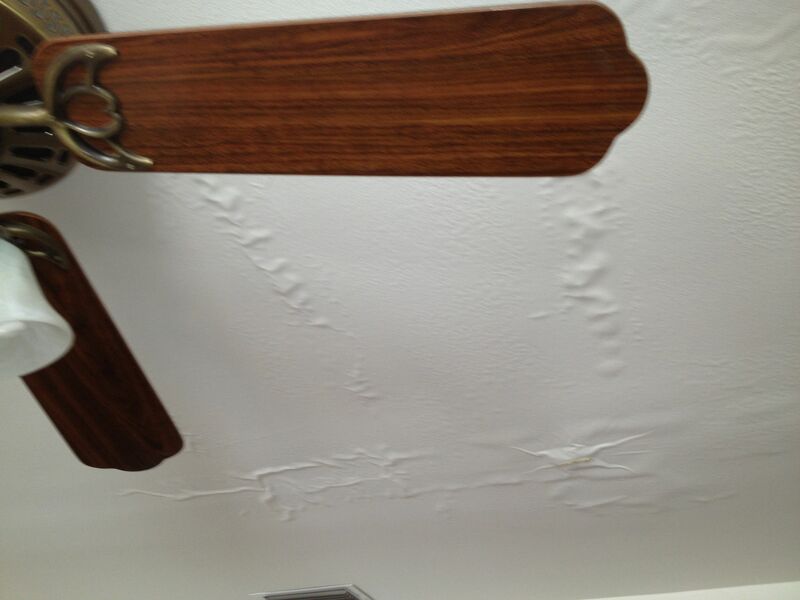 About two weeks ago our youngest daughter was sitting on the couch in the family room and asked a simple question, “Why are there bubbles in the ceiling, Daddy?” Much to our chagrin, once we looked up it was difficult not to notice areas that were clearly filling up with water. We had a leak (another one, as it turns out, since we’d had one almost two years ago). We immediately fetched a couple of buckets and pierced the paint holding the water in to relieve the pressure. I also immediately called the Plumber, who fortunately was able to come out and fix the leak. Stage one was complete. We’d stemmed the tide. 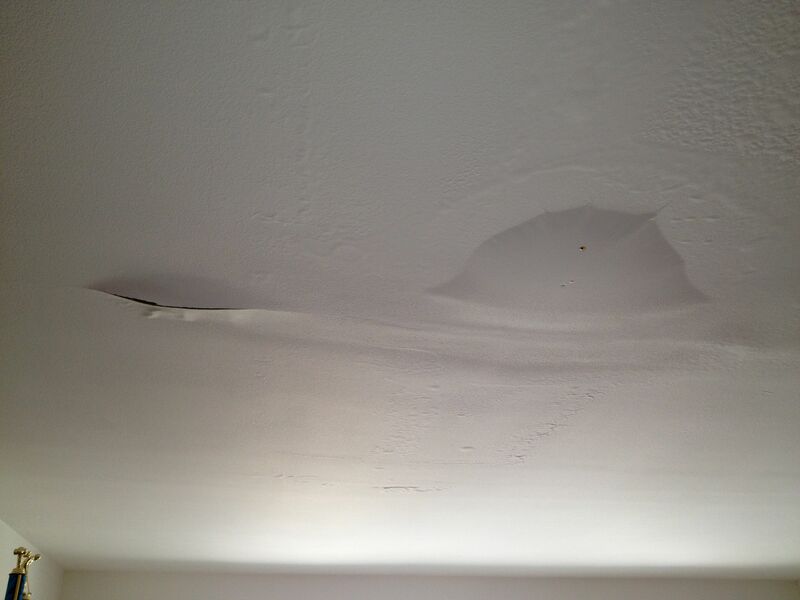 Unfortunately, the ceiling was now ruined and – as Shane the Plumber pointed out to us, there was still a fair amount of water up there. Next stage – contact the insurance company and get someone out who can fix the ceiling and bring us back to status quo ante. Would that it were so easy. Because of the age of our house, everyone now suspected there might be asbestos involved and we needed to have someone come out and test for both it . . . and lead, which might have been in older paint. Sure enough, asbestos was discovered but no lead <whew!>. So now we need to have specialists come in, completely seal off the room to avoid contaminating other parts of the house, and remove all the offending material. One problem. The room has to be completely emptied and nobody says they expect me to do it on my little lonesome. Hint – there are items of furniture in that room most 35 year old men can’t move by themselves, let alone a 65 year old man. So the guys show up but the room is as it was. They get all confused and, ultimately, leave without saying a word. Thus begins a bit of a Keystone Kops routine of non-communication, mis-communication, and confusion. As of today, I’m pretty certain things have been worked out. The company I was referred to by Shane the Plumber came out and packed up everything and moved almost all of it into the living room. Tomorrow the remediation company is scheduled to show up, seal off the room, dry the attic, and remove any asbestos they find. Unfortunately, they will have no choice but to seal off the back of the house, rendering it unlivable. I’m waiting for the adjuster to get back to me and authorize our staying at a local residence inn for Wednesday and Thursday nights; they say we’ll be able to return on Friday. In the meantime, the kids have school and life goes on. We get a two-day “vacation” I really don’t want yet have no choice other than to take. So . . . we’re off on a mini-adventure as of, well, as of now since we’re going to have to pack up and gtf outta here early tomorrow.